I don't have a lot of space to discuss this particular release, but let me just start off by saying this is definitely worth checking out. 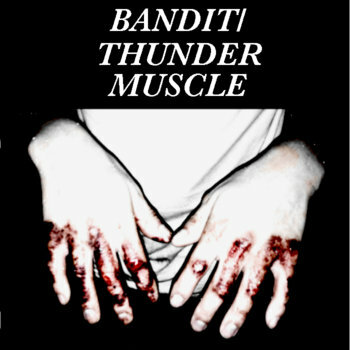 Bandit and Thunder Muscle are two of Delawares most exciting grindy powerviolencey noise punky bands and they both are doing some extremely cool things with their sound. With each and every song on the split being literally seconds long, this is definitely music for an ADD rattled generation. Bandit start it off with some really cool high energy music that you're not going to soon forget. There are some great grooves on these tracks that are nicely contrasted by powerviolence derived blasts of evil. Meanwhile, Thunder Muscle are not afraid to do some extremely unique stuff. I mean really, how many noise punk bands out there only use drums and bass? They bend the confines of the genre and give us something to stage dive too. I'll leave you with this, when I played a few cuts of this record on my radio show my supervisor happened to be in the room. Over the apocalyptic noise of Bandit he yelled "Is this supposed to be music, or is the monitor broken?"